The project Lottie Dottie Chicken (originally named Galinha Pintadinha in portuguese) began on YouTube in 2006 when Juliano Prado and Marcos Luporini first uploaded the animated video clip. This first video clip took on the IP name Galinha Pintadinha and chose the Lottie Dottie Chicken to be the main character. 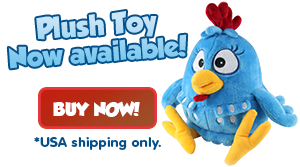 The Lottie Dottie Chicken is the star of the video clips, and other colorful characters make an appearance as well, such as Lil Butterfly, Little Yellow Chickadee, Purple Rooster and Ms. Connie Cockroach. The animated-musical video was uploaded on YouTube to be pitched to a Brazilian Children’s TV channel, which rejected them. A few months later, the video was discovered by moms, dads and children on the internet. At that time, the partners decided to take the risk and carry on with the project. They started up the production company Bromelia Produções (Bromelia Productions) to produce the first DVD. At the beginning, they didn’t expect that it would be so successful. They simply planned on selling DVDs through ecommerce as a compliment to their personal incomes. However, the unexpected happened in a colossal way, turning Lottie Dottie Chicken into one of the most well-known brands in the country. Millions of kids and their parents were viewing the videos on YouTube and buying hundreds of DVDs from their home-based ecommerce store. It was through YouTube that the project conquered parents and children, between the ages of 6-months and 5-years old. With colorful animations and easy sing-along songs, the kids dance and have fun in front of the computer, TV, smartphones, tablets and even in theaters. In Brazil, Bromelia Produçoes just completed its 4th DVD, with the same characteristics as the first three. However, this DVD is something different because many international folk children’s songs have been included, creating a cultural exchange among toddlers around the world. The musical cartoon is being translated and adapted to English and Spanish. Gallina Pintadita, the Spanish version, has reached 400 million views on its YouTube equivalent channel, with views distributed among the main Spanish-speaking countries in Latin America and Spain. “After starting to adapt and translate the songs, as well as form relationships with other countries, we realized how important it is to create an exchange of classic children’s songs from other countries and Brazil. Including songs from other countries establishes a cultural and emotional link with the local culture. Parents feel more confident sharing the songs with their children because it brings them back to the fond memories from their childhood. Lottie Dottie Chicken is most likely the first animated character that a baby has contact with. It’s important that this character not only attracts attention, but also leaves a positive lasting impression.” says Marcos Luporini, musical director of the series. 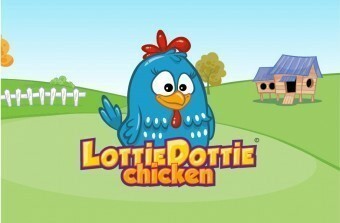 In February 2014, the Lottie Dottie Chicken channel in portuguese reached the 1 billion mark for YouTube views. In the world, this size of an audience has only been achieved by a small, restricted group of less than 50 channels, none of which are from Latin America. It was a very important accomplishment for the brand, which created a video to celebrate the very special occasion.